So was it a 3D Tupac hologram? Or a 2D Shakur with mirrors? Or perhaps the greatest surprise in musical performance history? Either way, what seems clear is that the larger than life surprise from the first weekend of the 2012 Coachella Valley Music Festival likely provided a glimpse of what is to come in the event industry’s future. Now, yes this five-minute experiment did reportedly cost Dr. Dre and company well over $100,000 to pull off but with James Cameron’s Digital Domain Media Group behind it, you can be sure that the ultimate goal is massive commercial success and exposure. And in order to achieve that, there has got to be more than one Tupac performance to go around. It turns out this hologram surprise was not actually a hologram afterall. It was in fact a projected 2D image built by a seven-time Oscar winning effects team – brought to life by combining today’s technology with 19th century smoke-and-mirrors trickery (please reserve your smoke puns for another site). This is the same group that’s responsible for trailblazing special effects in movies like The Curious Case of Benjamin Button, Transformers, Tron: Legacy, and Titanic. Once the CGI Tupac was built, a company called AV Concepts projected it onto the stage using “an angled piece of glass placed on the stage to reflect a projector image onto a screen that looks invisible to the audience,” per the Washington Post. Digital Domain’s chief creative officer Ed Ulbrich has made quite clear to the Wall Street Journal (the one media outlet he spoke to afterward) that the visage was not just a projection of found or archival footage. It was a completely fresh performance created exclusively for Coachella fans. That means there is more original material to come and new directions to explore – especially considering the immense buzz already generated from the five-minute unveiling. 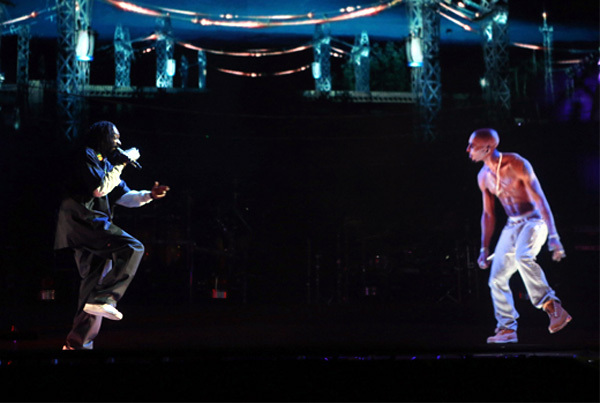 And per Dr. Dre, the creative force behind it all, there is a massive vision for how this recent hologram feat will continue to play out… which right now seems to be leaning towards taking Tupac on tour. So how will this affect the events industry you ask? Well for starters, the technology and materials needed to pull off the illusion are all commonplace and often used in the events industryand audio/visual communities today. It’s the application, creativity and shock of it all that brought the technology to the forefront last weekend. For now its likely too cost-prohibitive to attempt with just any budget, but like most innovations it will only get more efficient and cheaper to produce in due time. What today may be deceased rap icons like Tupac and Nate Dogg, may tomorrow be deceased guest speakers like Edison, John Wooden, and Benjamin Franklin. I think the holographic guest speakers thought, is a really good application for this – not only in the events industry, but in general entertainment. This could be in many cool ways to create even a new form of entertainment! I’ve heard rumor that the new Michael Jackson Cirque show in Las Vegas will use this or similar technologies as part of the entertainment presentation. Very cool!